A microcontroller is a highly integrated small computer on a single chip that contains many of the components required to control intelligent products. Typically, this includes a CPU, RAM, ROM, I/O ports, communications and a real time clock (RTC). In many applications, it is desirable to have a power backup mode which retains RAM data and keeps the RTC running in the event of a system power failure. Cymbet’s EnerChip solid state rechargeable batteries are backup power alternatives to traditional bulkier power sources, such as coin cell batteries and super capacitors. The board shown above illustrates many of the advantages of using an EnerChip rechargeable solid state battery for MCU power backup. The EnerChip is SMT/reflow solderable, permanently attached to the board, has a tiny footprint, lasts the life of product, has no air transportation issues and end of life disposal is the same as the other ICs on the board. 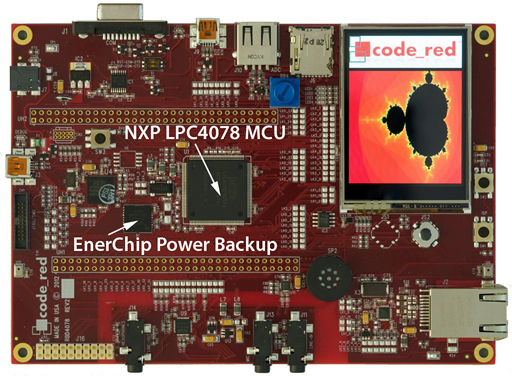 This NXP Code Red RDB4078 Development board features an NXP LPC4078 MCU with an EnerChip CBC3150 EnerChip for power backup of the MCU real time clock during main power failure. Technical specifications for this dev board can be found on the Code Red website. The backup power current of the microcontroller may be of the order of 1 µA with the RTC oscillator on, but the actual current will depend on the specific device and supply voltage. The backup current will be approximately proportional to the battery backup supply voltage less 1.4V. In case of a button-cell lithium battery, the supply voltage will be 2.7V. In case of a super capacitor, the supply voltage will decrease linearly with charge until SRAM and RTC reach their operating cutoff, which will typically be between around 2.0V. Electrically isolate the microcontroller in the event of system power loss, so that the backup power sources do not have to power the rest of the circuit. This will limit the required backup current. 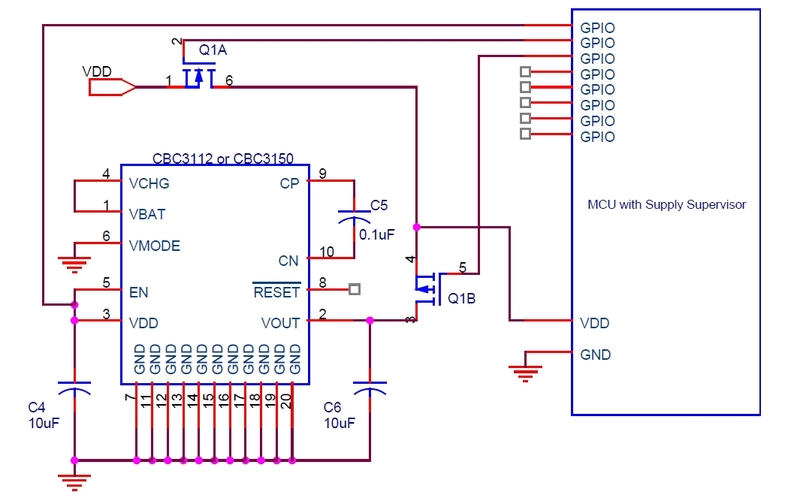 Select a low power CMOS microcontroller. Many microcontrollers are now available with low current drain in mind. Determine the true backup current. The backup current specified by chip manufacturers is often the worst-case maximum. The typical current may lower by a factor of 2, doubling the backup time. Determine the true required backup period. This may be hours or days to satisfy most applications. In most of the civilized world, over 99% of power outages are less than 1 hour in duration. The backup power period in hours will be the capacity of the backup energy source in µAh divided by the expected data retention current in µA. Please click the link below to take a quick survey on power backup energy storage devices for Real Time Clocks and Microcontrollers. Your industry expertise will drive the next generation of solid state batteries for microelectronic power backup applications. 1 – This survey is anonymous. No one will contact you and your company association is unknown. Providing honest answers will help to normalize the response data. 2 – In appreciation for your time, Cymbet will make a donation on your behalf to the charity Doctors Without Borders/Médecins Sans Frontières. This humanitarian charity operates independentlyof any political, military, or religious agendas and has A rating from the American Institute of Philanthropy. Determine power outage duration. In the case of Primary AC interruption, studies have shown that 99.5% of all these outages are 4 hours or less. The outlier data ranges up to 14 hours. Please click on the RTC Backup table an the RTC Backup webpage for the power outage study details. Calculate the amount of back-up power required using the MCU sleep current specifications. – Many other popular MCUs are supported. Please contact Cymbet for additional information.